This winter card turned out so nice. To me this just has a sense of quiet and peace for a "cold winter's night". And believe me its been cold here. Southern Wisconsin in December and our night time temps have been single digits! 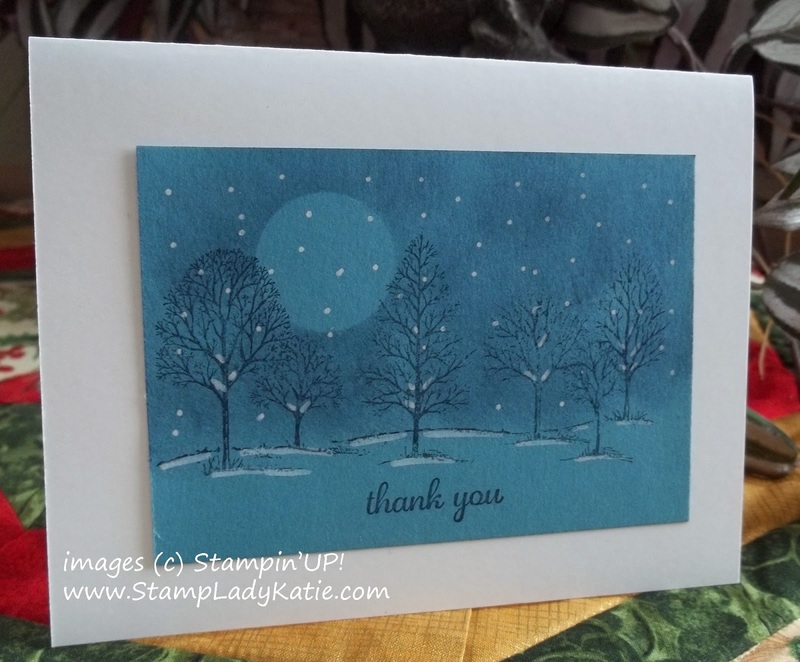 We're doing this card at our December Stamping Events. People have commented that this is an easy card to make and how much they LOVE the Chalk Marker. Can you visualize how we made the sky and moon? To make the "stars" we used the Chalk Marker. Its great for snow on a card like this. Its more subtle than a Gel Pen. The Gel Pen gives a brighter white. This really is a white marker and the ink flows really nicely off of the tip. In this second photo you can see I added a little "snow" to the trees and used the Chalk Marker to define a snow line along the ground. 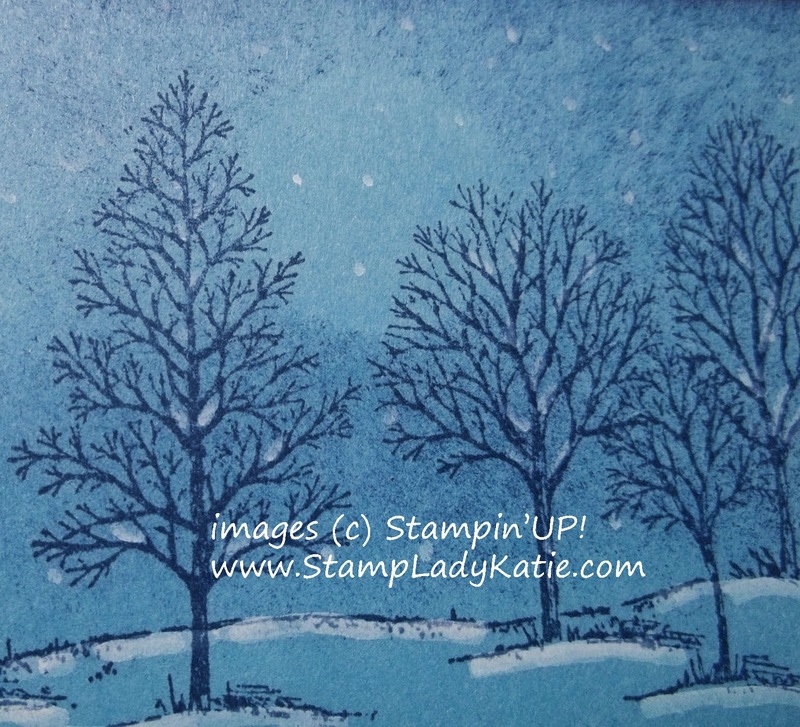 This card features 2 of Stampin'UP! 's most popular products. 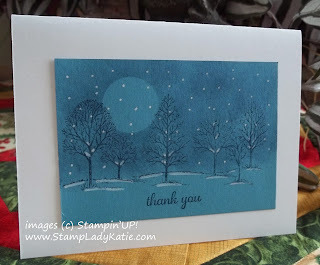 If you are a fan of Stampin'UP! 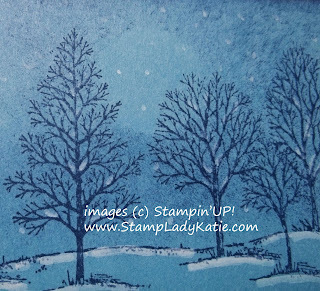 you might recognize the stamp set: its Lovely as a Tree. This set has been around forever and has been one of the most popular sellers. The Chalk Marker is also a popular seller - its so nice to have a white marker. It was introduced in the Holiday Catalog and will also be featured in the upcoming Occasions Catalog. Have you seen our catalogs? You can browse on-line by clicking the catalog links below. Contact me if you'd like me to send you a paper copy. Paper copies are the best! You can write ideas next to the stamp images and yellow highlight the sets you have. My catalog is full of post-its. and all your stamping supplies here.